Salamo Arouch, a young Greek of Jewish descent became middle weight boxing champion of the Balkans in 1939. All his 24 fights ended with a KO. An absolute record. Surely he would have had a stunning career. Instead after Germany invaded Greece he and his family were deported to Auschwitz-Birkenau together with thousands of other Greek Jews in March 1943. While the women of the family were gassed on the first day of their arrival, Salamo, his father and his brother were coerced into forced labour. Once the guards found out that he was a famous boxer they forced him to fight other prisoners for the entertainment of the Nazis. The loser would be gassed mercilessly. Somehow Arouch survived Auschwitz winning 208 fights by KO. After the liberation he emigrated to Palestine and witnessed the foundation of the state of Israel. This incredible story, starring Willem Dafoe (at his absolute best) as Salamo Arouch is told in Triumph of the Spirit. Shot on location at Auschwitz this is one of the most impressive movies on the Holocaust I have ever seen. It feels spooky to know that we are actually seeing the very place where all this happened. Salamo Arouch came back to Auschwitz as an advisor during the shooting of this movie. He died in April 2009. I had so many questions while watching this… So many thoughts… What was it like to go back there after having endured all this? What was it like for the actors to play in such a movie in such a place that was saturated in pain? Can you still feel this? And what was it like to play a prisoner of Auschwitz? I think this must be one of the hardest roles for any actor. I was also wondering if this movie would not be good material to teach Auschwitz and the theme of the concentration camps in schools. And I was wondering, once more, how all this could have happened. When you see the guards, hit the prisoners, see how malnourished they are, so hungry that they would almost kill their own for a tiny piece of bread. The way they had to sleep with such little space. When you watch how thousands are forced to take showers but were ultimately gassed. When you see the piles of clothes, shoes, hair, jewelry… and the piles of bodies that had to be cremated. How could anyone help in any of this? How could that happen? I think we need to have such movies, we need to know what humans are capable of, and stay alert and never let this happen again. Another question I was asking myself was: Would I like to visit Auschwitz? I must admit, I wouldn´t. I believe that places can store pain. I would not want to get this close to it. What about you? Would you want to visit Auschwitz? This entry was posted in Concentration Camp, Greece during WWII, History, Movie, War Movie, WWII and tagged Auschwitz, Concentration Camp, Greece during WWII, History, Movies, Salamo Arouch, True Story, War Movies, Willem Dafoe. Leonardo De Fillipis makes religious movies. He has one outstanding show, http://www.stlukeproductions.com/dramas/saint-maximilian, Maximilian, Saint of Auschwitz. Most of his movies are one man plays that he performs live and in fact, that is what this movie is. Though I would not say those others are great, for me Maximilian is a masterpiece. A movie very much off the beaten track. This St. Maximilian as the movie shows not only died in Auschwitz but in years prior he established a Center in Nagasaki Japan that was unharmed by the bomb that fell. http://en.wikipedia.org/wiki/Maximilian_Kolbe If one should decide to watch it, perhaps the VHS video can be purchased at a reasonable price. I will have to find this movie Triumph of the Spirit, 1989?? Wow, I’m surprised I wasn’t aware of it especially since we all know of some of his other movies, Platoon of course, the Last Temptation, Mississippi Burning and To live and die in LA. I did not know De Fillipis. Just saw he did a movie on St. Thérèse… Just had a look at those links… There sure are remarkable people in this world… To die in place of someone else… Would be curious to see that drama. 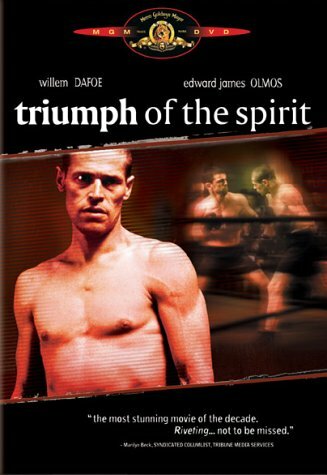 I was a bit surprised to discover Triumph of the Spirit as I really like Dafoe…Thought I knew most of his movies. I accidentally ran into this, Leni Reifenstahl in the 1930s made a movie to quote one website that was a “paen to Nazism”, Triumph of the will http://www.ihffilm.com/10.html , seemingly a similar name. I don’t know it but not long ago, I think I saw something about this Reifenstahl lady, I think I remember now, I read a book (for the 3rd time we see this word) Triumph: the untold story of Jesse Owens and Hitler’s Olympics on Jesse Owens, African American athlete who of course, won track gold medals at the 1936(?) Summer Olympics and she, Reifenstahl was at the Olympics filming it and got a lot of material. By the way, Jesse Owens became friends with one of his German competitors who actually gave Owens some advice on how to win the high jump competition, the German also died during WWII in action I think. Right off I don’t know if there are movies on those Olympics, for some reason, I think there is a Jesse Owens story movie around. Leni Riefenstahl is actually a fascinating character. Extremely criticized in Germany and said to have been Hitler’s pet. “Olympia” is the name of one movie but she did many more. Triumph of the Will is pure nazi propaganda. Her books about the Nuba are worth seeing though but she has been criticized for those too as beeing colonialist. I think she was foremost famous for her aesthetics. I saw an interview a few years back, she had just turned 100 and looked like a 70 year old. At 70 she started deep sea diving. Incredibly energetic person. However she died soon after at 101. A very controversial figure but as already stated highly fascinating.